The Music Library welcomes project proposals within the guidelines of the fund as detailed above, as well as requests for purchases of contemporary music for the Music Library. Please contact the Music Inquiry and Research Librarian, Matthew Vest. The Contemporary Score Edition is published by the UCLA Music Library, Hugo Davise Fund. The publication includes the first printing of physical scores and parts and a digital score in eScholarship, the institutional repository of the University of California. Scores considered for the Edition are student scores that win Davise Prizes, UCLA faculty scores created for Davise musician and ensemble residencies, and scores created for Davise sponsored commissions or projects. For more information, please contact the Music Inquiry and Research Librarian, Matthew Vest. Image: the first score in the UCLA Music Library, Hugo Davise Fund's Contemporary Score Edition, Awake 3.0 by Tomàs Peire Serrate. Awake 3.0 by Tomàs Peire Serrate. M522.S47 A93 2018, eScholarship, Library Catalog. Use fonts consistently. Verdana and Times New Roman are good choices for title, page numbers, etc. Hugo Davise was born Hugh Edward Davies in 1907. A lifelong Angeleno, Davise worked for the Department of Agriculture during World War II. After the war, he earned his doctorate in philosophy at UCLA, and spent much of his career teaching at Santa Monica College and Los Angeles City College. His devotion to music was unwavering but private; he did not seek out acclaim or public performances. 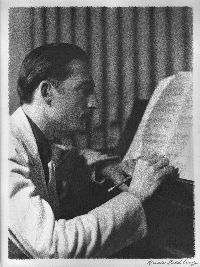 Yet he studied and composed in the most significant styles of the twentieth century, producing atonal, polytonal and modal works, and developing his own compositional system in response to that of Arnold Schoenberg. Davise taught privately into his late eighties. His students learned strict counterpoint, composition, and music history. His former student, composer Ginger Mayerson, writes, "Hugo was a great teacher; I learned a lot about composition, music history, and a few things about myself…I think Hugo and [wife] Christine between them knew almost everything about western music and it was wonderful to listen to them talk about it." Although he wrote in multiple genres, the bulk of his music is for solo piano, his own instrument. Thanks to his bequest to the UCLA Music Library, many of the Davise scores are available in the Performing Arts Special Collections as photocopies. Originals are held in the private collection of composer Marco Marinangeli, Davise's student and protégé for over fifteen years, who considers Davise one of the exceptional musical minds of the twentieth century. Davise died in 2000.